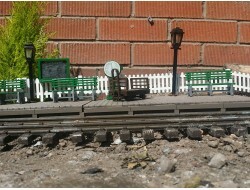 The North Pilton Works has been set up to build a wide range of affordable 16mm scale products. 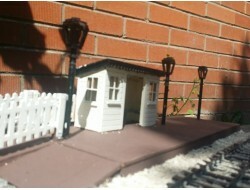 Which includes, Buildings, Lineside, Locomotives and Rolling stock for Garden Railways. 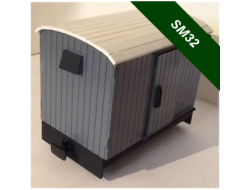 We offer a full range of kits for 16mm scale with accessories, fencing, buildings and rolling stock for SM32 and G45 gauges. 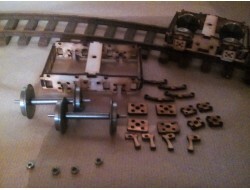 We also have a range of ready to run locomotives and rolling stock that are built to order and supplied painted. 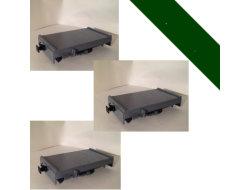 All rolling stock in our standard range are available in two widths, 96mm wide and 110mm wide. We are now producing a growing range of kits for the Seven Eighth scale scene with accessories, fencing, rolling stock and soon locomotives. 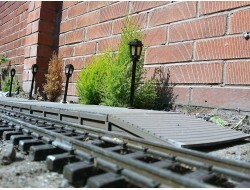 The SE (7/8th scale) range is based on 1:13.7 scale (22.24mm:1ft) and has a growing popularity with G45 gauge representing 2ft gauge and 32mm gauge representing 18 inch gauge railways. 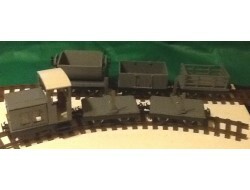 This new range is based on a 120mm wide chassis and includes 2 axle and new bogie rolling stock. 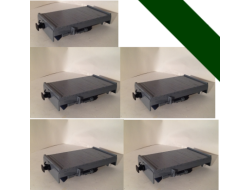 All the new rolling stock kits made for the SE range will be re-scaled to add to our extensive 16mm scale range of rolling stock as 110mm wide versions. 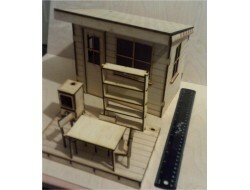 Built from laser cut, high quality 3mm plywood. 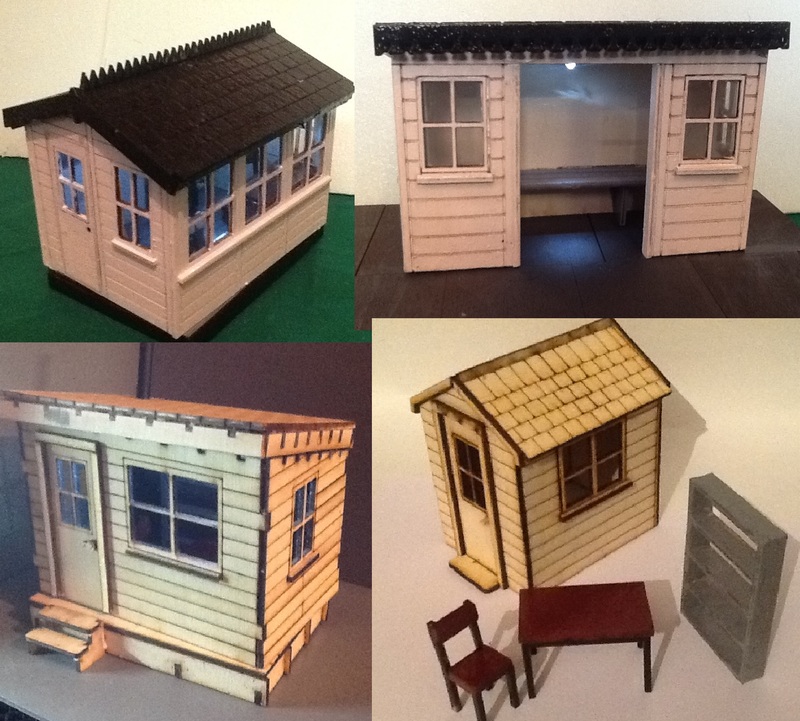 We supply Buildings, Rolling Stock and Lineside accessories, Easy build and of great detail. 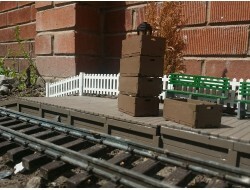 The Kits will complement any existing layout. 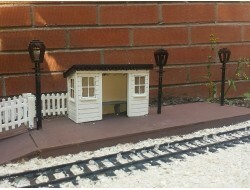 In our range of kits we have line side accessories, bench seating and platform trollys, signals, a complete picket fencing system and a range of buildings. 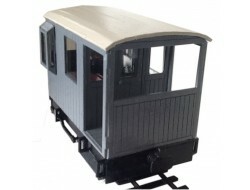 All our standard range of rolling stock and locomotives is now available as either kit, unpainted built up or ready to run painted in slate grey or ever green livery. 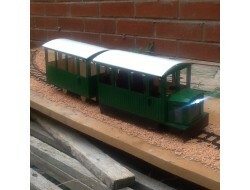 The rolling stock is available in two widths, 96mm and 110mm wide versions. 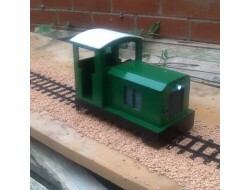 The locomotives are designed with options for full radio control and are supplied with bi-directional lighting, metal grills and drive on all axles. 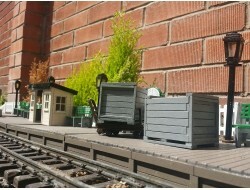 We have extended the range to include a full fleet of bogie wagons and coaches available in both widths for platform wagons, open wagons, box vans and coaches. Our Industrial range has a smaller foot print with the chassis measuring 76mm by 138mm long and include a full range of Diesel locomotives and rolling stock. 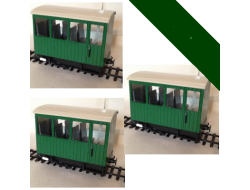 The width over the body of wagons and coaches is 80mm and has a full range of rolling stock that you would find on any small industrial narrow gauge line. 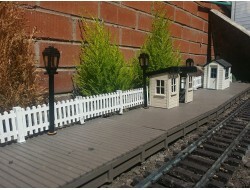 We also offer these as full train sets with kits to build up locomotives and a fleet of wagons or coaches with a bulk discount. Our diesel locomotive is designed as a powerful battery electric engine with a large cab one end and..
A kit to build up a small industrial diesel engine on our new chassis driving on both axles, complet..
A delightful rail bus locomotive with optional trailer car. 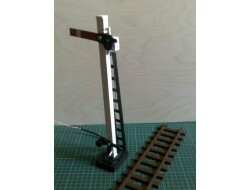 ..
Our Rail Bus Passenger Set comprises of the locomotive and a trailing coach and designed as a powerf.. 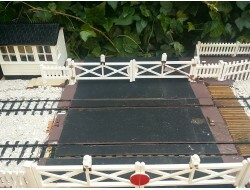 Remote Control for Garden Railways Easy to Instal – Long Range Control upto 12 Trains Full Instructi..
Our modern Flexity Style Tram Set is designed to represent the Bombardier modular tram solution. 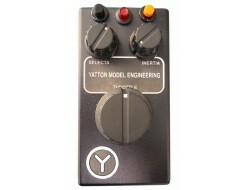 The..
Our Tram locomotive is designed as a powerful battery electric engine with a cab both ends and centr.. 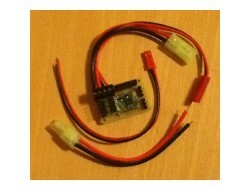 This sound card adds sound to the RX1 receiver card for use with battery electric transmitter system..
A kit to build up an industrial diesel tram engine on our new chassis complete with motor, battery p.. 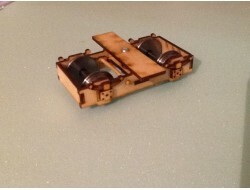 PAIR OF COACH BOGIES FOR SM32 or G45 GARDEN RAILWAYS A Detailed Kit, To Build Your Own Pair O..
A complete Industrial Narrow Gauge Twin Train Set - Diesel Locomotive and the Tram engine with two c..
Open Balcony Bogie Passenger Coaches for SM32/G45 These open balcony bogie passenger coaches are id.. 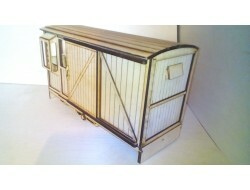 Bulk pack of THREE Coaches for Garden Railways. 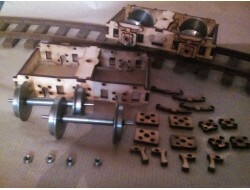 Passenger Coach Freelance design Hand Craf..
A detailed set of parts to build up six fence panels and a gate with brass hinges. 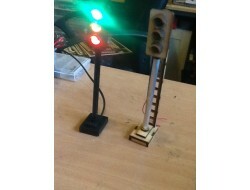 The posts are mad..
A Detailed Kit, To Build Your Own Level Crossings Gate That Integrates Into Our Fencing System. The.. 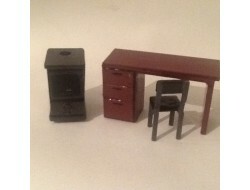 Seven Eighth Scale Station Accessory Pack with 3 Bench Seats A complete kit of station accessorie.. 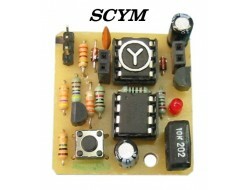 Battery Locomotive Radio Control Receiver For SM32 16mm Scale Remote Control RECEIVER for Ba..
A detailed cattle van with drop down doors and locking bars. 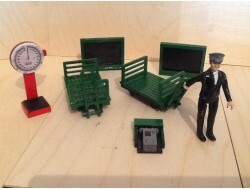 Available in Grey or Green livery fo..
Coach for Garden Railways. 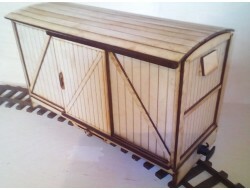 Passenger Coach Freelance design Hand Crafted Ready To Run Inter..
A complete Industrial Narrow Gauge Train Set - Diesel and five wagons A set of kits to build up a..
A detailed kit to build up four working station lamp posts including metal post, bright LED's and gl..
A detailed kit to build up four working street lamps with a smaller head 20mm x 20mm x 40mm on an al.. PAIR OF WAGON BOGIES FOR SM32 or G45 GARDEN RAILWAYS A Detailed Kit, To Build Your Own Pair Of Wa..
A kit to build up a complete wooden platform with four base sections and two end slope sections meas..
PICNIC SEASON IS HERE This kit of three picnic bench seats is an ideal addition to your garden rail..
A complete industrial railway bumper pack with two locomotives and nine wagons in kit form. 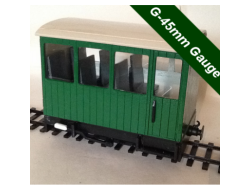 G45 gau..
A detailed observation style passenger coach for 7/8th Scale with pannelled sides and windows all ro..
A pack to build up a set of station accessories to include two platform trolleys, two notice boards,..
A Flat Bed wagon. with detail of separate planking on the bed and brake gear on the under side. ..
A pair of Binnies Centre Couplings with bolt fastning and a pair of 3 link steel chains as a set. Th..
A pack of FOUR 3 link chain couplings for centre couplings. 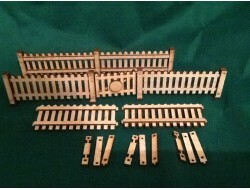 These are steel chains designed for use ..
A pack of parts to make up five platform bench seats for 16mm scale ..
A pack of ten fence panels with posts and a hinged 8ft gate (128mm wide) along with two corner posts..
Industrial slate wagon kit complete with couplings, 3 link chain links and Binnies centre buffer cou..
A pack of FOUR 3-link chain couplings (LONG) for centre buffer couplings. 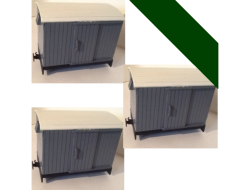 This pack contains a set ..
A pack of six stacking wagon load crates measuring 54mm x 36mm x 24mm high (3ft 4.5 x 2ft3 x 1ft6) ..
A pair of large cargo crates on pallets for wagon loads. 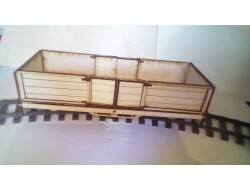 16mm scale kit of parts to build two comple..
Industrial guards van kit complete with axles and couplings, 3 link chain links and Binnies centre b..
A 7/8th sxale slate wagon with roller bearings and heavy metal insulated 25mm extended axle whe..
Based on the Gemenc forest railway logging bogie for hauling lumber loads, these have a coupling eac.. 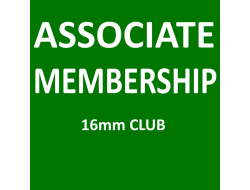 Associate Membership As an ASSOCIATE member to our website, you will be able to login and get a 10..
GN15 /SM12 platform wagon running on 00 gauge track at either 16mm scale or G scale These kits are .. 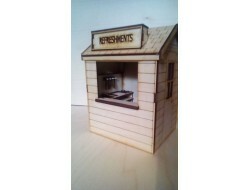 PACK OF SIX WOOD PALLETS FOR GARDEN RAILWAY IN 16MM SCALE Laser cut from 3mm birch plywood and su..
A detailed building in 7/8th Scale for a work mans cain with interior furnituare and lights. 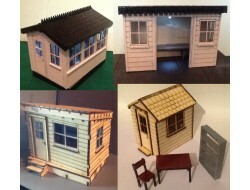 The cab..
A detailed kit to build a 7/8th scale line side hut with interior furniture and light. This planked .. PAIR OF PALLET TROLLEYS FOR GARDEN RAILWAY IN 16MM SCALE Pack contains two pallet trolleys, two p..
Part of our extensive range of SE bogie wagons This short bogie box and giuards van wagon kit is ..
Industrial Semi Open Coach kit complete with axles and couplings, 3 link chain links and Binnies cen..
Part of our extensive range of SE bogie wagons This short bogie box van wagon kit is designed for..
Part of our extensive range of SE bogie wagons This short bogie open wagon kit is designed for 7/..
A pack of THREE 7/8th scale pic nic benches with serving trays. 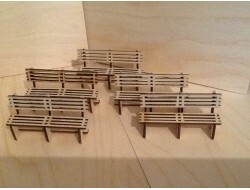 Each table has a seat each side ..
A pair of 7/8th scla e wagon bogies including 28mm roller bearing axles. 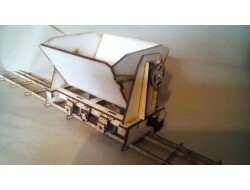 A robust and detailed pa..
Part of our extensive range of SE bogie wagons This short bogie platform wagon kit is designed fo..
A detailed heavy industrial tipper wagon for 7/8th scale garden railwaysA detailed kit with tipping ..